Hole #6 was designed to make use of the two tree that frame the fairway. This park site did not have very many trees, so I wanted to make the most of them. 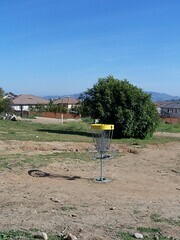 You can choose to fire straight between the trees, or RHFH and LHBH throwers may choose the hyzer route around the left-hand tree. The two trees are dense - do not expect to fly through them. The B tee is tucked around the corner of the adjoining fruit tree orchard and presents a tricky anhyzer shot for RHBH throwers.